KATHMANDU: Denizens of Kathmandu Valley are celebrating the traditional festival of ‘Gaijatra’ in memory of the deceased member of their families. According to the lunar calendar, Gaijatra festival falls on the first day of the waning moon in the month of the Bhadra (Bhadra Shukla Pratipada). The celebration, which literally means the festival of cows, is marked with various dance and drama performances; mainly in different places of the three districts of the valley — Kathmandu, Lalitpur and Bhaktapur. The festival is observed mainly by the Newar community, though other communities also participate in the processions. People take out a rally, in memory of their deceased loved ones, dressed like a cow among many other kinds of strange and humorous costumes with peculiar appearance. The bereaved families along with bystanders offer fruits, bread, beaten rice, curd, money among other items to those participating in the procession. 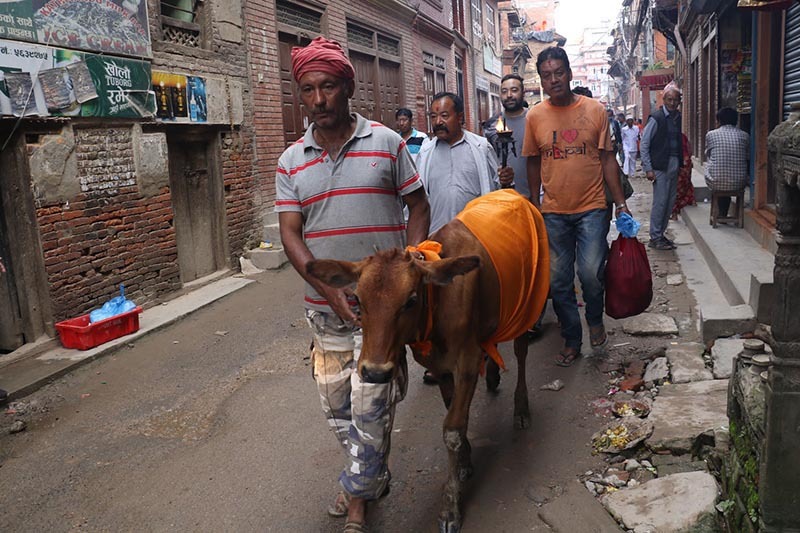 Actual cows are also brought out in the rally as it is believed that cows help the deceased to make their way safely to heaven. Gaijatra derives its name from the religious belief that the deceased, during their journey to heaven, cross a river by grabbing the tail of a cow. The then King of the Malla dynasty, Pratap Malla, started the festival to express that there are many others suffering from the pain of losing a dear one when his queen lamented over the death of their son, Chakravatendra Malla. People throng in and around different parts of Kathmandu Valley to mark the festival. Gaijatra also carries a powerful social aspect. It is celebrated as an occasion to satirise evil traditions and practices of the society. Comedians celebrate the festival by organising shows with satiric performances on failures of the government, political parties, leaders and the society in general as a away of creating awareness and for merry-making.